This study has 7 sessions, incorporating an introductory session and 6 lessons. The Study Set includes the Study Guide by Little Rock Scripture Study Staff and the New Collegeville Bible Commentary, The Letter to the Hebrews, by Daniel J. Harrington (Liturgical Press). Daniel J. Harrington, SJ, PhD, is professor of New Testament at Boston College School of Theology and Ministry, Cambridge, Massachusetts, and editor of the Sacra Pagina series, published by Liturgical Press, and author of numerous other books and articles. Hebrews is more like a sermon than a letter. It reviews the history of Israel to demonstrate how Jesus Christ fulfills and even surpasses all the hopes express in the Old Testament. It presents Jesus as the unique High Priest who is simultaneously the one who offers sacrifice to God and is himself the sacrifice. It describes the exaltation of Jesus Christ as superior to all that came before, whether prophet, priest or angel. Jesus is presented as our High Priest whose compassion for us is rooted in his humanity, but whose sacrifice is all sufficient because he is without sin. Those who receive this sermon/letter are reminded of the great heroes of faith found in the Old Testament and are urged to imitate their faithful endurance. 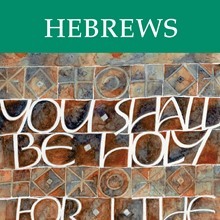 These lectures correspond to the seven sessions outlined in the Study Set for Hebrews.